While Gibson faced financial trouble in 2018, it’s reassuring to see the behind-the-scenes worries haven’t negatively affected the iconic American brand’s ability to deliver an exceptional guitar. At the higher end of the new catalog of 2019 models, the Les Paul Standard is another iteration of Gibson’s most famed model – although one with some controversial new features. Today we are taking a closer look at this truly premium guitar. Starting with the basics and the Les Paul Standard naturally features the iconic single-cutaway body shape. This is made from solid mahogany with an AAA figured maple top, which looks awesome through whichever paint job you choose. A Heritage Cherry Sunburst is available for the more vintage-inclined guitarists, although bold finishes such as the translucent Amber or mouthwatering Blueberry Burst are also options. The unique washed-out Sea Foam Green may be an acquired taste, but we love it. All are finished in a sleek high-gloss breathable nitrocellulose lacquer and feature ultra-modern weight relief, for a very comfortable playing experience that doesn’t compromise on sustain. The build, fit and finish – as you would expect from a Les Paul handmade in Gibson’s Nashville facility – is nothing short of perfect. The mahogany neck is equally impressive, featuring an asymmetrical SlimTaper profile that fits the hand perfectly. Set into the body, this neck houses a quality rosewood fretboard (1.69” nut width and compound radius), with 22 medium frets and acrylic trapezoid inlays. Ultimately, you don’t get much better than this for design, finish, playability or that smile-inducing feeling of playing a premium Les Paul – top marks here. Pickups don’t come much better than American-made Gibson humbuckers, and the Standard features two – both BurstBucker Pros, one Rhythm at the neck and a Lead at the bridge. 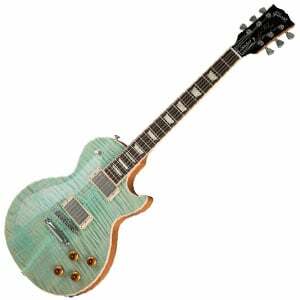 This is complemented by Gibson’s special HP-4 High Performance Circuit and versatile modern controls. You’ll find two volume and two tone controls, one for each pickup – all of which have push/pull functionality. The volume knobs double up as coil taps, allowing you to change both humbuckers into single-coils and back again with ease. The tone knobs have their own function, with the neck tone knob allowing you to change the phase of the pickups, while the bridge tone control allows you to choose between the inner or outer coils when split. Around back, the five dip switches add yet another level to the onboard versatility. This is tonal flexibility at its highest level, never before seen on a Les Paul. The slightly less glamorous components also stand up to scrutiny, such as the aluminum Nashville tune-o-matic bridge and stopbar tailpiece, the excellent high-ratio Grover Locking Rotomatics tuners, and a self-lubricating TekToid nut all contributing to rock-solid tuning stability and lengthy sustain. Having read this far, you probably won’t be surprised to hear that there’s tone aplenty here. With the tone controls, coil splitting and a myriad of options thanks to the dip switches, this Les Paul is able to create pretty much any tone you want. Whether you’re looking for warm and jazzy humbucker cleans, sparkly Strat-style leads, growling blues grit, or searing hot modern rock shredding, the Les Paul Standard delivers. Everything comes across warm and rich, packed with tone, articulation and character. Thanks to the pickups working in conjunction with the bridge design and weight relief, the sustain is endless. The Les Paul Standard is anything but standard for a Les Paul. Sure, it features the classic design, high-quality Gibson build and is oozing tone, yet the newer features such as the electronics, locking tuners and neck design break away from tradition. While some guitarists are quick to disparage these features, they ultimately deliver one of the most versatile, playable and reliable Les Pauls ever made… what’s not to love about that? For more info about the Gibson Les Paul Standard 2019, click here.